Compelling evidence is the most crucial component of any personal injury claim dispute. Video surveillance is one of the most powerful tools insurance companies have at their disposal. Video evidence can influence pre-trial negotiations, jury decision-making and courtroom verdicts. Anyone who has initiated a car accident injury claim should expect to be a target of covert video surveillance. Investigation by video surveillance is a common approach used by defending insurers to influence the outcome of a personal injury claim dispute. Modern technology has made the act of anonymously recording individuals easier now than ever before. Video surveillance is often conducted by one or more private investigators trained to go unnoticed. Private Investigators hired by insurance companies in Ontario are bound by rules set forth by the Security and Investigative Services Act. Video evidence, if collected lawfully is admissible in court. Surveillance is routinely used at the trial of a personal injury claim as substantive evidence of the plaintiff’s misrepresentation of functional abilities or as impeachment evidence to attack the plaintiff’s credibility. 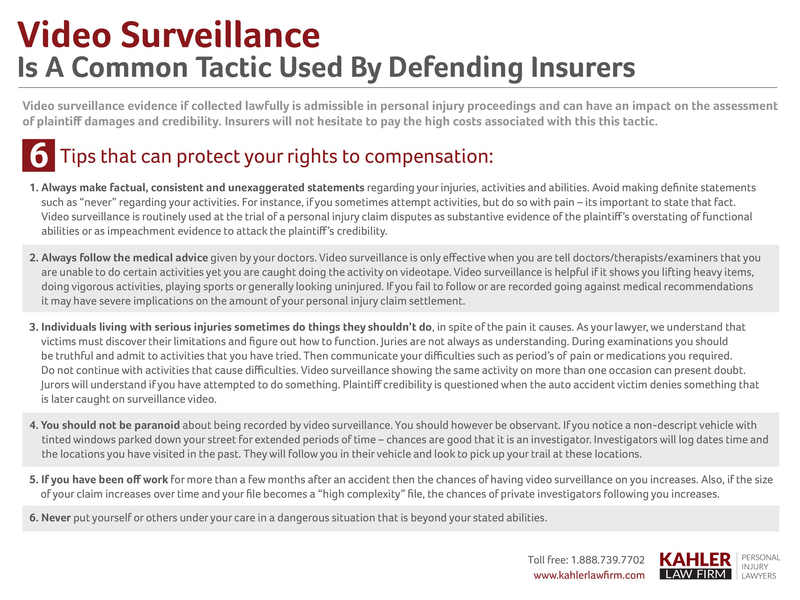 Based on the fact that video surveillance evidence can have such an impact on the assessment of plaintiff damages and credibility, insurers will not hesitate to pay the high costs associated with this this tactic. To illustrate inconsistencies in plaintiff abilities depicted in and out of examinations, Discovery and court. Malingering – show an exaggeration in the level of disability caused by the accident. Substantially reduce the value of a plaintiff’s settlement in pre-trial or courtroom preceding’s. Surveillance conducted over various time periods is often a strategy used by defense counsel to counter the “It was a good day” defense. Showing vs. Telling. Juries can be persuaded by what they have seen over what they have heard; such as testimony from opposing experts. In efforts to make the most impact, damaging video surveillance is often not presented until late in trial or pre-trial process. In relation to video surveillance, the role of a plaintiff personal injury lawyer is to advise you of the possibility of surveillance and encourage you to make factual, consistent and un-exaggerated statements regarding your injuries, activities and abilities. Establish and defend your credibility as best they can. Plaintiff counsel must insure that video evidence is admissible, was collected lawfully and that no privacy laws were breached. Plaintiff counsel should seek to discredit the objective view of video surveillance. Individuals living with serious injuries sometimes do things they shouldn’t do, in spite of the pain it causes. Life still goes on for those who have been injured, there are stages where victims must discover their limitations and figure out how to function. If video evidence appears less than compelling, plaintiff counsel may play to juror sympathies and highlight the extraordinary efforts insurers and defense has gone to abandon their policy and financial obligations. If a surveillance video is used against you at trial your lawyer will likely request the full unedited footage in order to establish the context or circumstances involved. Low quality video and intermittent recordings should be disputed. Any video surveillance that does not contradict or is not relevant to plaintiff statements with regards to abilities should be argued as inadmissible. The admissibility of video evidence should also be disputed if it does not show the plaintiff performing the activity pain-free.